Women tend to have germier offices than men, according to a new study on office germs. The study comes from University of Arizona researchers Sheri Maxwell, B.S., and Charles Gerba, Ph.D. It was funded by the Clorox Company. The researchers swabbed the offices of 59 women and 54 men in New York City, Los Angeles, San Francisco, Oregon, and Washington, D.C. They sampled eight sites in each office: the phone, desktop, computer mouse, computer keyboard, exclamation key on the computer keyboard, pen, bottom of desk drawer, and handle of desk drawer. Those samples showed twice as much bacteria in women's offices as in men's. The researchers also swabbed workers' personal items at the office, including personal digital assistants (PDAs), women's purses and makeup cases, and men's wallets. Men's wallets had more germs than any other item studied — personal or office. The researchers also looked for methicillin-resistant Staphylococcus aureas (MRSA), a drug-resistant form of staph bacteria that typically infects the skin but can also infect other parts of the body, including the blood. Relatively few workers — about one in 15 — had MRSA in their workspaces. However, MRSA was more common in women's work spaces, the study shows. The moldiest spot in the workers' offices was the bottom of their desk drawers, where many staffers stash food. "As people spend more time at their desks, germs find plenty to snack on," Gerba says, in a news release. "They're breakfast buffets, lunch tables, and snack bars, as we spend more and more hours at the office." Mold and yeast — which were most common in women's offices — were also found on the phone, desktop, and computer mouse. The study doesn't mention the workers' occupations. Clorox Company funded that study also. SOURCES: Maxwell, S. "Men vs. Women Office Study," Dec. 14, 2006. WebMD Medical Reference: "Understanding MRSA." 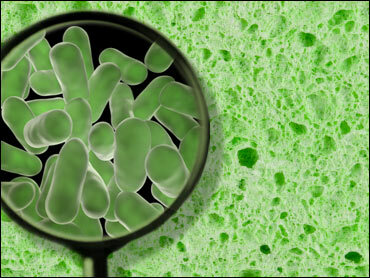 WebMD Medical News: "Top 9 Jobs Where Bacteria Thrive." News release, Ketchum.